Ballistas were used in ancient times as seige weapons. I made this one with wood, a small sapling for the bow and an arrow made of light dried wood. 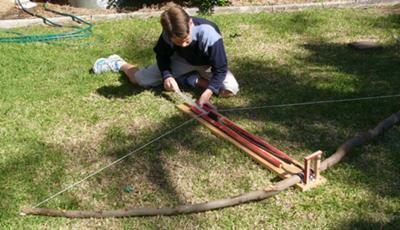 I load the ballista by pulling back the string and placing it into a groove or notch which I made in the wood. Then I put in the arrow which has two nails to secure it on to the rope. Then I lever the rope very quickly so that it comes out of both side grooves at the same time and lets the arrow shoot straight out. It probably works better if you put some bricks underneath it to make a better shooting angle. 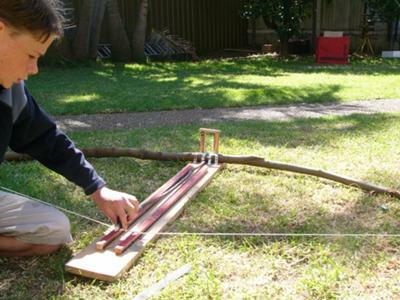 Here's a short video of my homemade ballista shooting an arrow.